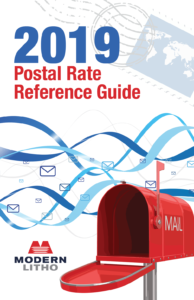 Click image to download the 2019 Postal Rate Chart. The following information lists USPS rate changes and pricing that take effect January 27, 2019. The Full Service IMB discount for First-Class Mail remains 0.3¢ per qualifying piece. The “Additional Ounce” rate for First-Class is decreasing by 6¢ from $0.21 to $0.15. The Nonmachinable Surcharge is also decreasing by 6¢ from $0.21 to $0.15. The spread between the First-Class AADC rate and the 5-Digit rate is reduced by 0.1¢ (from $0.030 to $0.029). Single piece First-Class Commercial Flats prices are decreasing 10.8%. Business Reply Mail, which currently pays the Metered Letter price, will now pay the Stamped price. The Full Service IMB discount for MM increases from 0.1¢ to 0.3¢ per qualifying piece. The spread between the Marketing Mail AADC rate and the 5 Digit rate is increased by 0.2¢ (from $0.023 to $0.025).